When I first thought of this page, I envisaged a gradual accumulation of data from occasional finds of the name on war memorials and local cenotaphs. In fact it took only a few hours to identify the 8 Blackburns killed in Vietnam and the 476 Commonwealth Blackburns killed in the two World Wars and elsewhere. I guess this is both a strength and a weakness of the internet - all the information in the world is available, but it takes a lot of the fun and adventure out of it. I'll keep looking for real occurrences and will add photographs of any such finds. I would also appreciate any contributions from visitors, particularly on the Vietnam Wall, as I doubt I will ever get there. This year we visited the vast memorial at Thiepval to the thousands (73,357) of soldiers killed on the Somme whose bodies were never found. It rained (appropriately) and it was only when leaving that I realised that there were books listing all the names and so I could have photographed all the Blackburn entries. The picture above is one of the several Blackburns we found, together with the memorial itself. who died on Wednesday 9th August 1916. Age 23. Son of Fred and Jane Blackburn, of "Greenmount", Heaton, Bolton. who died on Wednesday 9th August 1916. Age 27. 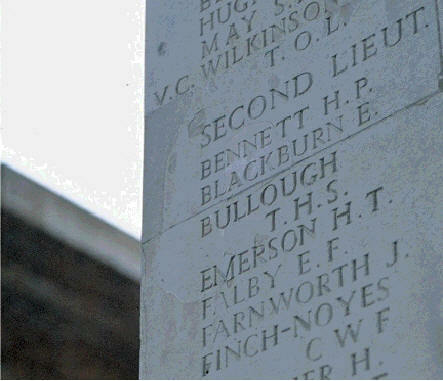 It seems clear that these two brothers, Lieutenants in adjacent companies of the same battalion, were killed on the same day. 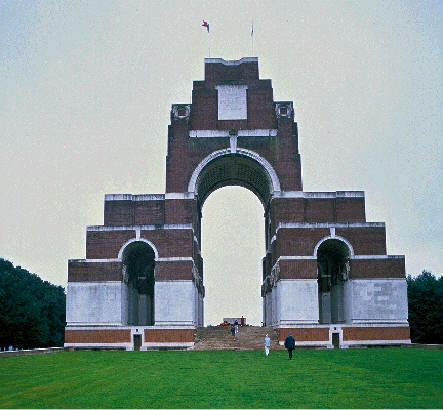 I have now tracked down a local newspaper report and that is on the Thiepval page, together with the details of all the other Blackburns commemorated there. Having found the American equivalent of the Commonwealth War Graves Commission - American Battle Monuments Commission the time has come to split up this page. So far as I have been able to find out, there were no Blackburns killed on 9/11.